In the past many people raised their companion birds exclusively on a seed-based diet. Numerous studies have now shown that a pellet diet offers far more benefits to companion birds than a seed-based diet, including more reliability in terms of ensuring your bird is receiving a balanced diet. A pellet diet can be more important for certain types of birds than other birds. For instances, finches have a tendency to eat the majority of the ingredients used in major types of finch seed mixes. Parrots are known for being notoriously picky. It is not uncommon for a parrot to go through their seed mix and only pick out what they prefer. As a result, it can be difficult to ensure your parrot is receiving a balanced diet when they are consuming a seed-only diet. If your bird is on a seed-based diet, the most important factor in making sure they maintain good health is ensuring they receive a variety of different seeds in the right amounts. You also need to make sure you are providing your bird with a good array of supplemental foods, such as fruits, sprouts, vegetables, etc. on a regular basis. The benefit of pellets is that you no longer have to guess about whether your parrot is receiving what he needs. This is precisely why many commercial aviaries and zoos have made the switch from seeds to pellets. The most important key to keep in mind when trying to make the switch from seeds to pellets is that you need to do so on a gradual basis. Even if it seems that your parrot is accepting of pellets, you run the risk of shocking his digestive system if you try to make the change too rapidly. Instead, it is much better to introduce your parrot to the pellets over a gradual period of time, such as two to three weeks. You may also find that in some parrots, especially older birds, there is some level of resistance. In this case, it could potentially take up to several months before your bird will completely accept the new diet. One of the easiest ways to help in introducing your parrot to pellets is to mix the food with other foods your parrot may like, such as vegetables, fruits and other treats. This can help to encourage your parrot to accept the pellets. You might also find it helpful to offer your parrot several small meals each day. Another effective method is to remove your bird’s food dish and then re-introduce it from time to time, primarily filled with pellets. Keep in mind that seeds can certainly be beneficial to your parrot and definitely offer nutritional value. Therefore, you should continue to make a point of providing seeds to your parrot in a moderate amount once he has accepted the pellets. Be sure to use a variety of different seeds. A great way to include seeds in your bird’s die is to hide them in areas that are difficult to reach. This can add variety to his diet while also keeping him active and entertained. Unfortunately, not all birds are keen to try new foods, and some are downright stubborn about trying anything new. Here are some tips for offering new foods in a way that might entice your picky pet bird to try some new things. *Start young if you can - young birds are usually much more willing to try new foods than older birds who may be "set in their ways." *If a food is totally new to a bird, it may not even recognize it as food. Offer new food in a familiar dish with other foods you know your bird already likes, and he or she may try the new food. Even if your bird only gets a taste of the new food by accident they still might decide they like it. *Place a couple of treats such as sunflower seeds, raisins or cheerios in a dish of new food. Your bird will likely get a taste of the new food while extracting the treat (the key here is to only use a couple of the treats and make your bird dig through the new food to get to them). 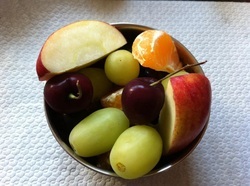 *Offering new foods first thing in the morning is helpful, since this is when many birds naturally forage for food. Offer new foods alone first thing in the morning, and then give them their usual food a couple of hours later. *Try different forms of new foods - some birds prefer raw vegetables to cooked, while others are the opposite. Some like cooked veggies warm, others prefer them cooled. Some birds might be more willing to taste a puree or even juice made from new vegetables. *A food that is ignored in a food dish might be eaten if offered in a clip on the side of the cage or in a play area. Try weaving greens through the bars of the cage, and using a clip for slices of vegetable or fruits. *Offer a chunk of corn on the cob, which many birds like to gnaw on. Bright orange or yellow fruits and vegetables often attract attention Try a mix of brightly colored veggies, in bite sized pieces and mixed together (cooked or raw). *Give leafy greens freshly washed and still wet and hung from a clip. The droplets of water may attract your birds attention. *Offer foods after you have a bite - watching you eat the food may be all the temptation your parrot needs. Try making a fuss, acting like this is the best food you have ever had, and maybe even feed some to another family member to help convice your parrot that this is something he/she really wants to eat! *Most birds enjoy eating freshly sprouted seeds, which are an excellent source of nutrition and are often helpful in enticing birds to make the leap from seeds to greens. Never starve a bird into trying a new food. The Way A Food is Presented May Determine if a Bird Eats It or Not! Your bird may reject a carrot stick, but it may be willing to taste carrot if it is grated or peeled. A bird may prefer to eat bits of carrot mixed into special birdy muffins or bread, baked just for your pet, even though it won't go near grated carrot in its bowl. Some birds really relish corn wheels (corn on the cob, cut into round pieces) and others prefer corn cut into long pieces. Yet, other birds prefer the corn cut off the cob. Skewering veggies onto a metal pole, and hanging it in the cage, may entice a bird to nibble foods good for it. 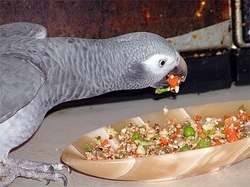 It is easy for a bird to take a piece of food that it doesn't want to taste, and hurl it out of the food bowl, but if it wants to remove a shish-kabobed veggie from the cage, it will need to rip it up into pieces to drop it to the cage bottom, and in the process, it will be likely to taste the veggie, and may even ingest a bit. The same goes for food that is tied to a perch. Instead of putting veggies and other nutritious foods into a separate dish, it may be beneficial to mix it into the seed mix, so that the bird runs into it while fishing for the seeds. Of course, it should go without saying that all fresh fruits and vegetables should be thoroughly washed before being offered to your birds. Potentially harmful bacteria and other microorganisms may be found on the surface of fresh produce. 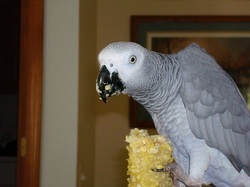 Parrots love the sweet taste of corn on the cob! It can be given to them in many different ways. If you have problems getting your bird to try veggies then try mixing some pieces of sweetcorn cooked or uncooked in with its food. Most parrots will readily eat it in large chunks held in their feet, many prefer to do this as it is great fun for them to pull off all the little pieces. Cut off a chunk 1-2 inches wide cook or uncooked- whichever your bird prefers! You can also attatch a large cob inside the cage if your Grey is a real lover, he may even hang from it while he is munching! Unfortunately, not all birds are keen to try new foods, and some are downright stubborn about trying anything new. Here are some tips for offering new foods in a way that might entice your picky pet bird to try some new things. Start young if you can - young birds are usually much more willing to try new foods than older birds who may be "set in their ways." If a food is totally new to a bird, it may not even recognize it as food. 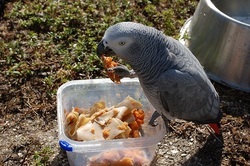 Offer new food in a familiar dish with other foods you know your bird already likes, and he or she may try the new food. Even if your bird only gets a taste of the new food by accident they still might decide they like it. Place a couple of treats such as sunflower seeds, raisins or cheerios in a dish of new food. Your bird will likely get a taste of the new food while extracting the treat (the key here is to only use a couple of the treats and make your bird dig through the new food to get to them). Offering new foods first thing in the morning is helpful, since this is when many birds naturally forage for food. Offer new foods alone first thing in the morning, and then give them their usual food a couple of hours later. Try different forms of new foods - some birds prefer raw vegetables to cooked, while others are the opposite. Some like cooked veggies warm, others prefer them cooled. Some birds might be more willing to taste a puree or even juice made from new vegetables. A food that is ignored in a food dish might be eaten if offered in a clip on the side of the cage or in a play area. Try weaving greens through the bars of the cage, and using a clip for slices of vegetable or fruits. Offer a chunk of corn on the cob, which many birds like to gnaw on. Give leafy greens freshly washed and still wet and hung from a clip. The droplets of water may attract your birds attention. Offer foods after you have a bite - watching you eat the food may be all the temptation your parrot needs. Try making a fuss, acting like this is the best food you have ever had, and maybe even feed some to another family member to help convice your parrot that this is something he/she really wants to eat! Most birds enjoy eating freshly sprouted seeds, which are an excellent source of nutrition and are often helpful in enticing birds to make the leap from seeds to greens. Egg shells; low fat cheese; low fat yogurt; mineral block; collard greens; turnip greens; mustard greens; chicory; kale; dandelion; broccoli; almonds; brewer’s yeast; buttermilk; oats; kelp; cooked dried beans and peas; sesame seeds; tofu; oranges; berries; parsley. Large chunk size veggies! Long stem broccoli, whole brussel sprouts, carrots and large chunks of sweet potatoe! Normal potatoes are great too but if your bird refuses to eat them then trying sweet ones can make a difference as they have a beautiful soft texture and sweeter taste- Yummy! 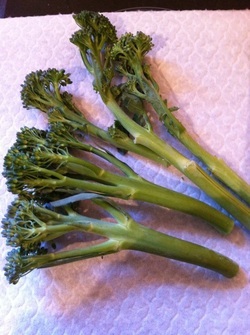 TIP: If your Grey refuses to eat broccoli, try lightly boiling or steaming some with really long stems like these. Not only do they really enjoy the chunky long stems its easier for them to hold! Serve warm or some birds may eat raw. 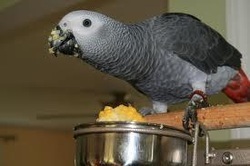 When Preparing fruit or veggies for your African Grey, always try to present it in large foot size chunks. If chopped to small or cut in pieces they may refuse it- it could be the difference between trying and liking different food and refusing to try! With an unusual texture and a sweetly tart taste, pomegranates are a special treat for pet parrots. The succulent juicy seeds are like candy and they are full of nutrition, especially antioxidants that support a parrot's immune system. Digging the seeds either out of a fresh pomegranate rind or from a homemade food blend you create yourself makes the pomegranate a food and a toy--two treats in one. Because fresh pomegranates have a short life, you can freeze the seeds to treat your parrot all year long to its favorite fruit. Set the pomegranate on your cutting board and hold it tightly with one hand. Place the sharp edge of your knife at the crown of the fruit, and make a cut halfway to two-thirds through the pomegranate. Cut it deep enough to pry your fingers into the cut, but not so much that you cut the fruit completely in half. Use your fingers to pry the pomegranate into two pieces. The reason you want to pry it apart instead of completely cutting it in half is because by tearing it apart, it is easier to get at the seeds. Take each half and cut again, beginning at the crown and going only deep enough to insert your fingers into the cut. Again, pry apart the two pieces. 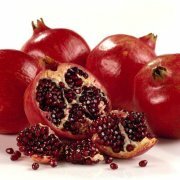 Dig into each pomegranate section and pry the seeds away from the peel and rind. Place the seeds on the baking sheet lined with wax paper. Separate the seeds from one another and spread them out on the baking sheet so you don't have clumps of seeds. Set the empty rinds aside. Place the baking sheet into the freezer for at least two hours. When the seeds are completely frozen, put them into a freeze-lock bag or storage container and store in the freezer for up to six months. 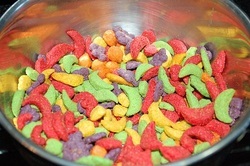 Take out a spoonful of seeds when you are ready to feed them to you parrot and mix them in with other foods or treats. Parrots love to search for the seeds, so it is always a fun game to hide them in other food or under toys. Bury the seeds in other fresh fruit such as apples or citrus fruits. 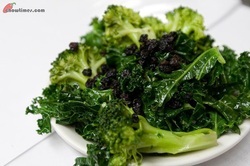 You can also sprinkle the seeds over a regular meal or hide them in a veggie mix. Keep the flesh and feed that to your parrot as well. Rich in beta carotene, the flesh of pomegranates is another healthy treat your parrot will relish.